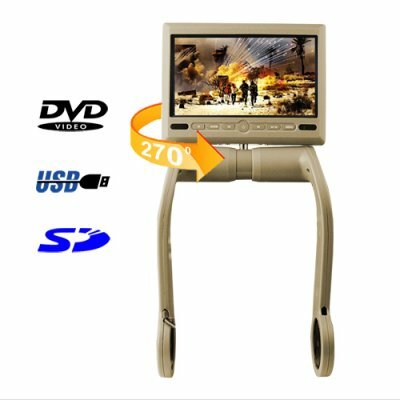 Successfully Added 7 Inch TFT LCD Armrest Monitor With Built In DVD Player - Tan to your Shopping Cart. 7 Inch TFT LCD Armrest Monitor With Built In DVD Player - Tan for the kids and other passengers at the back of the car to make those long trips a delightful experience every time. Perhaps you've considered adding DVD player functionality to your car, but the thought of extensive work behind your dashboard is a little too intimidating. Here's the perfect solution - DVD and multimedia on the go without all the technical fuss. This amazing 7 Inch TFT LCD Armrest Monitor With Built In DVD Player connects to your car battery or better yet plugs into your cigarette lighter slot. Once powered it plays all types of multimedia disks such as DVD/VCD/CD (audio or MP3) in crystal 7 inch LCD splendor! What's more, insert a USB flash drive or SD memory card into the player, and experience movies, songs, or even view pictures in the following media formats: AVI, DIVX, MP3, WMA, and JPG. Even though you're a family man now, it makes you want to call the boys and organize a road trip doesn't it? This 7 Inch TFT LCD Armrest Monitor With Built In DVD Player has built-in speakers, but you can just as easily use the FM transmitter function to output audio to your FM radio and experience rich stereo sound through your car speakers. That way your kids can watch the Hannah Montana movie in the back while you whistle along to the tunes upfront! Sounds fun huh? Don't worry about installation though. The leg stand forks by which the unit is attached to your car's armrest can be adjusted to fit widths from 185 mm to 252 mm. Now you won't have to hear another "are we there yet?" on your next family trip with this great LCD monitor with DVD player from the one and only, often imitated impossible to be duplicated, leader in direct from China wholesale electronics - Chinavasion. The LCD monitor can be viewed in 2 positions: upright (1) or swiveled and dropped down(2). In drop down position, the screen is upside down, but a quick press of the menu button allows you to invert the screen so you're watch video properly - right side up. Even though there is an "AV IN" button on the front of the DVD player unit, this unit does not support AV input. This function may be enabled in future models. This car audio unit does support AV OUT though, so that you can output media to a larger screen. The media will play on both screens. The leg stand forks can be pushed in or pulled out to fit many different armrest widths.